At the risk of sounding redundant, everyone knows that if there's one thing you simply have to try when you visit Buenos Aires, it's the kosher sushi. But if there's one thing better than enjoying kosher sushi in Bs As, it's enjoying kosher sushi while also engaging in the international intrigue of laundering counterfeit money. Don't believe? Listen! So, thanks to jetlag and the relentless oonta-oonta of the club downstairs from me that operates its truly impressive sound system until the early hours of morning, I've not exactly slept like a champ since arriving in Bs As (btw, this is my preferred abbreviation of choice for "Buenos Aires", though that will likely change over time). Yesterday (and today) I got out of bed at 11am, having slept like five fitful hours, and proceeded to do lots of emailing, blog-post-writing, and various other activities that make one feel productive but really are kind of wastes of time. So I braved the rain and decided to walk around the various sights and destinations of the Recoleta, and on my way to the National Library, stopped by a cafe for an espresso. It was hot as hell in this cafe, and with my walking and wearing a puffy coat and all, I was far from unsweaty by the time they brought me my coffee. I gave them a fifty, and then a testy discussion ensued between the two employees about the bill. They looked at it and held it up to light, and then gave it back to me, which was enormously confusing and did not exactly reduce my sweatiness levels. Diagnosis: counterfeit! Or, more accurately, possibly counterfeit, and I understood the lady to say that if there was any doubt, they didn't want to take the bill because then passing it along would get them in trouble. (Or she could have said, "I bore Diego Maradona's love child," given my shaky understanding of porteno espanol.) So instead, I paid with a different bill and moved along, concerned that on only my second day here, I'd inadvertently become a courier for illegal pesos. I stopped off at the National Library, which is on the site of the old presidential palace, and hence is said to be haunted by the ghost of Eva Peron. I didn't see Evita's ghost, but I did see a group of three people who immediately struck me as American. Hence, my asking them loudly, "Hey, are you American?" and boom--they were, in fact. We chatted for a bit--they were GWU MBA students on a pre-summer tour of S America--and they expressed surprise that I was American, interestingly. To compound the whole, fascinating phenomenon of somehow fitting in as a local, a guard came over while we were speaking very loudly (b/c we're American, obv.) in English, and said to me in Spanish, "You speak Spanish, right?" I agreed, and he explained that I couldn't sit on the railing I was sitting on, etc., but the interesting thing is that despite my having a hi-decibel conversation in US-English with the GWMBA folks, he still seemed to think I was a local. This is flattering, but also problematic, because people totally do not dumb down their Espanol for me as I need, but instead machine-gun me in their native tongue, which I still cannot comprehend at high-speed. Anyway, the fraud: At this point it was later aft and I was hungry as hell. I headed back to the main square of the Recoleta along a really nice park with sculptures by the national art museum, and found myself at a place a colleague had pointed out the other night. Strangely enough, this place specializes in kosher sushi (apparently at one point in the 20th century, Argentina had the fourth-largest Jewish population of any country in the world, but I don't think that's still the case). I popped in and took a seat, ordered with relative competence and ease, and eventually had some really good sushi (only critique--too much cream cheese!) while reading a New Yorker. Life was, as the man says, good. Then the bill came, and while I initially was going to pay w/Amex, I decided to opt for cash instead, and without thinking very carefully about it, handed the waiter the same $50 that had been rejected in the cafe earlier. Then, the following thing happened: nothing. I got my change, left a tip, and vamoosed. 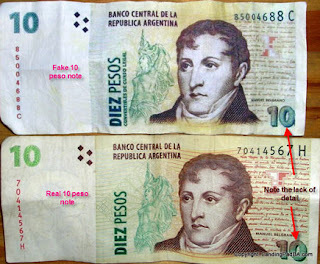 It was only quite a bit later, as I was going back to my apt, that I realized I may have passed along counterfeit pesos to my kosher-sushi friends. This could mean that I committed some type of Argentine crime within 48 hours of arrival. But even more concerning, it could also mean that I would no longer be welcome in the kosher-sushi joint that I'd liked so much and that I planned to be a regular at. A call to a local Bs As-based amiga sorted it all out: The reason that the cafe rejected the bill appeared to have been bogus (she explained to me in detail that I will not relate here, as it's not that interesting), and anyway they didn't say the bill was fake, but only that there was some doubt about it. More importantly, though, I was apprised that if the bill had really been fake, there's no way a fancy upscale place like the kosher-sushi joint would not have noticed and rejected it. So far from my defrauding the sushi place, I'd actually done the service of getting a second, better opinion about the bill's legality that confirmed that the cafe's doubts were all false. Whew. And that is why I am no longer worried that I am being sought by the porteno police in connection with an international scheme to launder counterfeit pesos at a kosher-sushi restaurant here in the Recoleta. So if you see my face on Interpol "Wanted" posters, I assure you it's all just a big misunderstanding. Seriously.